In his biography of William Rehnquist, John A. Jenkins ably introduces us to “the man.” Since there is no memoir (but many journals) it fell to an outsider to tell the world just who he was, and how he changed the direction of the Court after the Warren/Burger years. The author describes William Rehnquist as an extremely bright envelope pusher, and iconoclast, both “authoritarian, yet rebellious.” He further details him as a gambler, but not a risk taker. 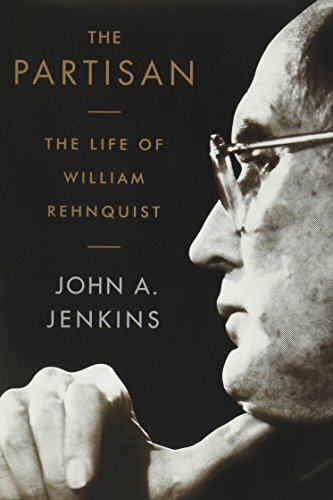 Mr. Jenkins clearly illustrates many of the circumstances forming William Rehnquist in a highly readable and understandable style. At the outset, the reader can understand how his early formation influenced his direction. The origins of his conservatism come from his humble beginnings in Wisconsin. Furthermore, the United States declared war on Japan while he was still in high school. He took up the mantle of Civil Defense and was later drafted into a segregated Army. While serving in North Africa, he read Friedrich Hayek’s anti-socialist manifesto, which had an impact on his thinking. Once back at Stanford, his mentor was a Constitutional Law professor, Charles Fairman, another influence throughout his life. After a brief but uncomfortable year at Harvard, he returned to Stanford Law School—a better (if more conservative) fit. He then broke through the Ivy League hold on Supreme Court clerkships to work for Robert Jackson. It is considered to be the first of “right place at the right time” opportunities for him. In this position, he became aware of the power of clerks to influence decisions. Given the liberal bent of most interns, he was determined to make a change. Arkansas Judge, Isaac Parker, a.k.a. “The Hanging Judge” (in the late 1800s) was another influence. This jurist resorted to swift, harsh sentences, feeling they had greater deterrent value. Another opportunity occurred when Atty. Rehnquist settled in Arizona after his time at the Court. He met and worked with Richard Kleindienst—a link to President Nixon’s Attorney General John Mitchell and a passport back to Washington as his deputy. The Court hobbled along until President Nixon appointed William Rehnquist who survived a contentious confirmation. He still had to answer for memos written during his clerkship. Law Review analysts were hard put to identify a “consistent constitutional theory.” The author claims his judicial consistency lay in his reactionary ideology. Justice Rehnquist consistently played the role of pragmatist, opting for a desired outcome rather than surrendering to precedent or the glacial pace of red tape. Liberal as well as conservative analysts recognized his potential for leadership. He was always efficient, making reasoned but quick decisions and never looking back. Unlike many of his colleagues, his was a six-hour day. Justice Rehnquist assumed the position of Chief Justice in 1986, a position he held for 19 years. There was an almost Teflon-like quality to his ability to glide through another contentious confirmation as Chief Justice since old memos from his clerkship came back to haunt him. Despite his unshakable views, he often voted with the majority, although he never minded being a lone dissenter. A reference indicates that he was in the majority in 3,351 of 4,353 cases in which he participated; an obscure footnote in a later chapter gives this information. In this respect, the work would have been enhanced by including more examples to illustrate his presence among a sometimes fragile majority. The strength of this book comes from exactly this feature: The author focuses on the man and does not get mired in cases. The most notable of these was his 2000 opinion upholding Miranda, after years of opposing it. More of these examples would have been illuminating, especially for the lay reader. Majorities are fragile happenings, especially when conservative justices tend to go their own way as Justices Kennedy, O’Connor, and Suitor often did. In 2005 the Court lost a venerable old soldier—one whose brash ways ironically endeared his colleagues to him. The reader will at least understand this more clearly as a result of reading The Partisan and may come away with some of the same feelings.